Have you ever lost heart, or your motivation, or your sense of purpose? I have. I’m there now. I feel like I’m just going through the motions. Then I started reading Paul’s letter to the Ephesians. From prison in Rome, Paul wrote to encourage the church not to lose heart. From prison! If anyone had reason to lose heart, it was Paul. But he didn’t. Instead he chose to pray for us. As a result of his prayer, I sensed a new strategy forming for the new year–a strategy to seek God’s point of view more frequently so I can understand the bigger picture; and a strategy to ask Him for a fresh and more frequent infusion of His power, from His Spirit to mine, so I can come closer to accomplishing His will for my life. Then it occurred to me. That’s a new year’s resolution I can keep. All I have to do is seek and ask. God will have to do the work. Happy New Year to me! 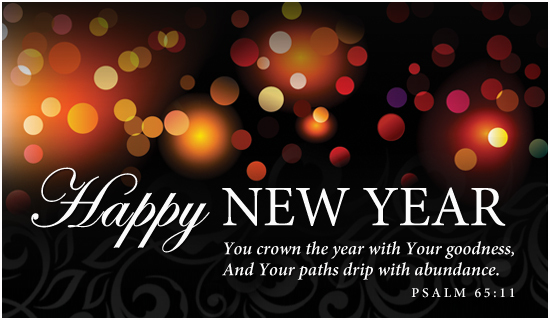 May God crown your year with an infusion of His strength and goodness. Happy New Year … 2016 is going to be awesome. Hang in there, Linda. 2016 has wonderful opportunities and marvels ahead.